The first bonus round is the ‘big money scatter bonus’. Three icons trigger this game by appearing on the reels at the same time: drumsticks, snare drum, and hi-hat. If you manage to make this combination, you will reveal a prize. 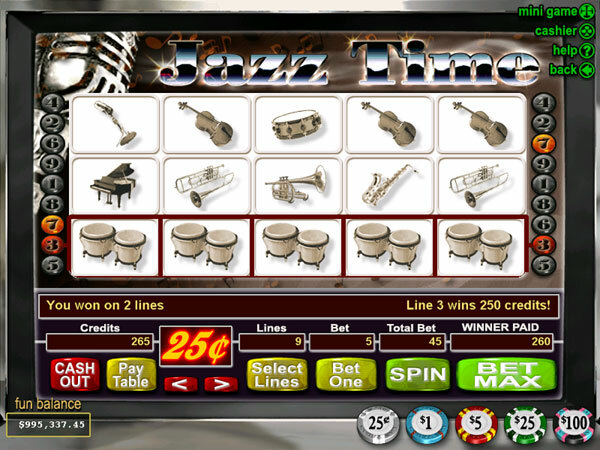 The second and more elaborate bonus game is the ‘jazz jam session bonus’. Spin three of the piano icons across the reels to trigger your access to this bonus. Then you will hear a drum kit starting a groove in the background and you have four instruments in front of you; the piano, the double bass, the trumpet and the guitar. Add them one by one to the ‘jam session’ to hopefully create a smooth groove. With each instrument you add, you will get a prize.